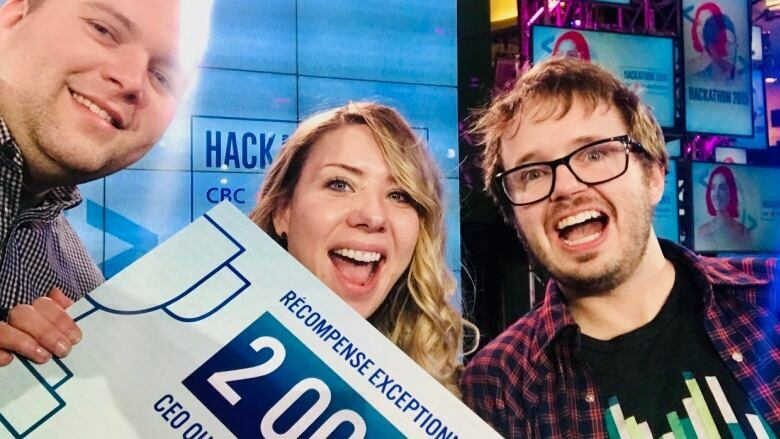 Three young professionals and technology experts living in Yellowknife won CBC’s 'hackathon,' a contest that calls on people from across the country to improve CBC's digital tools - in just 20 hours. A team of three from the Northwest Territories say they're still reeling after winning first prize for an idea that's meant to make radio in the North more shareable. 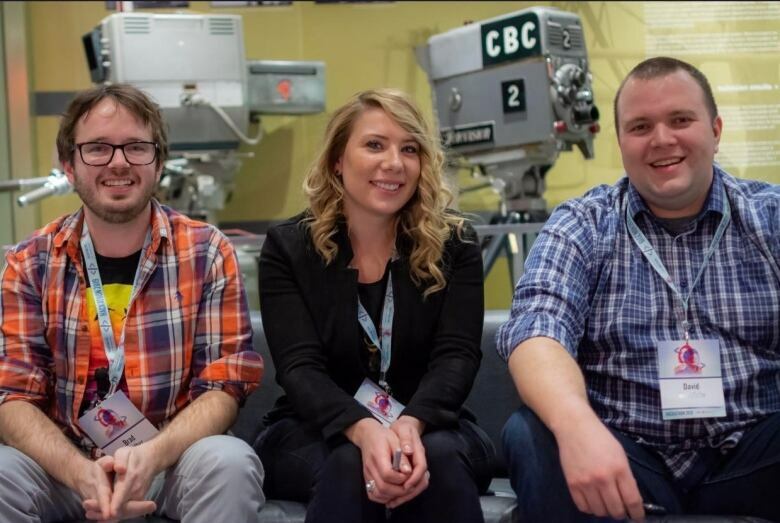 Megan Cooper, Brad Poulter and David Wasylciw, young professionals and technology experts living in Yellowknife, were among 16 other finalist teams to take part in CBC's first "national bilingual hackathon," a contest for people across the country to create a demo that will improve CBC's digital systems and tools, like its website. The challenge? Do it in 20 hours, some of it live on TV. The group was able to create a demo that uploads live radio to CBC's website, and makes it searchable and shareable. Anybody can search for a keyword — like a community or a person's name — that was said during a specific radio show and share the segments wherever they'd like. 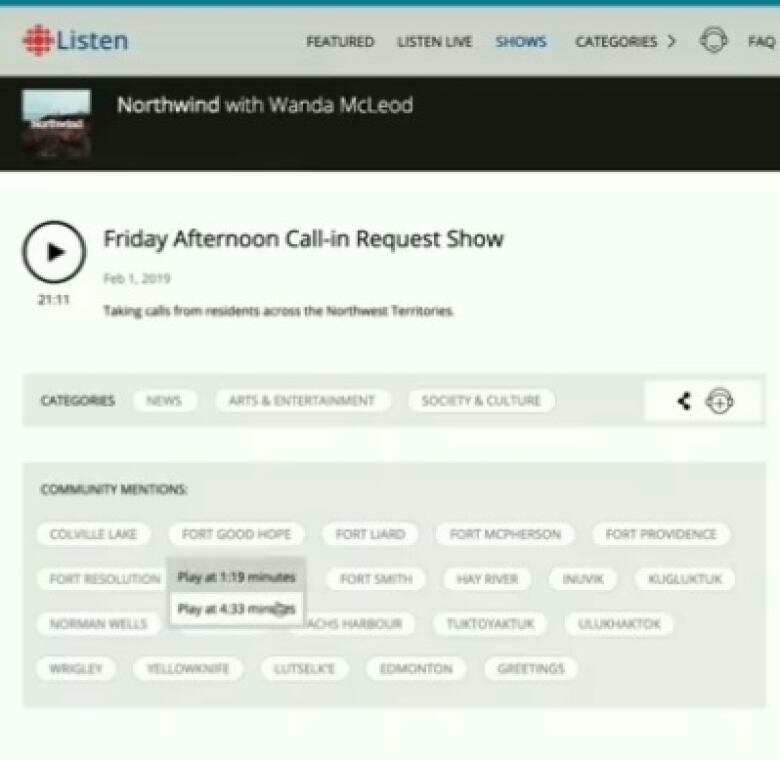 A screenshot from the group's demo, which showcases the radio show Northwind and the communities mentioned during the segment. Poulter says they used Northwind's call-in radio show, hosted every Friday by Wanda McLeod in Inuvik, for the group's demo. "So now presumably someone could give someone else in another community a birthday greeting on the [call-in] show and then they could link that link directly on the person's Facebook page or the community page just to wish them happy birthday again," Poulter said. Poulter, Cooper and Wasylciw each won $2,000 for their creation. CBC now owns what they made; the idea is that the corporation's digital team will bring the group's demo into production, so people can use it in the real world. Part of the 20-hour hackathon contest included a three-minute presentation to a panel of judges, experts from Microsoft, Amazon and CBC's digital team. Poulter says the judges and other participants were shocked to learn how many people in small, northern communities listen to CBC radio faithfully — many in their Indigenous languages — sometimes using it as a way to get in touch with loved ones. "I'd be listening to CBC North in my car and I'd hear a fantastic story maybe from an elder [about] going out hunting or what he's doing day-to-day or something that he thinks is interesting. "And then it's not captured online. I can't really share that with friends … or I can't go back and hear it again or I can't save it. "Local community radio is the original social media network," Poulter said, adding that's what he and his teammates wanted to channel. They hope their demo will be used for more than sharing radio, like translating Indigenous languages. Poulter says it already has a built-in dictionary that includes northern words that other computerized programs can't always understand or detect. "It would learn the pronunciations," he said. "It would get better and better as it goes, as it gets more and more audio through it."